The Cockburn Association was formed in 1875 and can claim to be the oldest civic association in the world. It is a pleasure and an honour for me to be its Chair and to have been invited to deliver this Annual Lecture, though the words that follow represent my personal views and not necessarily those of the Association and its large membership. The Cockburn is a registered charity that seeks to protect and enhance Edinburgh. We are “For everyone who loves Edinburgh”. If you love Edinburgh, but are not a member, then please consider joining us, or even volunteering your time to assist our work. Our Annual Lecture celebrates the birthday of Lord Henry Cockburn who was born on 26 October 1779. He was a passionate defender of this city, and opponent of those whose actions threatened its qualities. Without him, and others of like mind, Edinburgh today would have been a lesser place. Thirty-one years after his death, the Cockburn Association was formed to celebrate his contribution to Edinburgh and to further his work. Famously, in 1849 Lord Cockburn had written satirically a Letter to the Lord Provost on the Best Ways of Spoiling the Beauty of Edinburgh. In it he argued that public authorities had a duty to “preserve what chiefly distinguished this place.” In the 21st century we have become familiar with the concept of urban competition, and the importance of places playing to their strengths and “unique selling point”. Cockburn had grasped this idea over 160 years ago. As we celebrate his birthday here this evening, his ghost may return to remind us of other insights and verities that today’s custodians of the city seem to overlook. Cockburn advised the Lord Provost on how to spoil Edinburgh. There is no need to do that today. Such advice appears to be superfluous, as ever more ingenious ways to deface the city are being proposed and put into practice. Instead, I want to present my ideas on how to make Edinburgh an even better place. To do that, I need to follow the path that Lord Cockburn marked out, and which the Association named after him has successfully followed for so long. However, these are turbulent times, and we need to recognise the kind of factors that are shaping decisions about the future of our city. The international, UK and Scottish economies are plagued by uncertainties; they have been since the financial crash of 2007-8, and the fall in oil prices since 2014 and the outcome of the 2016 referendum on the EU have exacerbated the problems. Quantitative easing and the financialisation of companies means there is no shortage of funds for investment, but after the way that property triggered the crash, financial institutions are shunning sites and forms of development unless they are risk-free and can offer secure and attractive returns. This brings parts of Edinburgh, and some types of development, into play. The fall in oil prices has hit the economy of the north east of Scotland, leaving the Edinburgh region as the key driver of the Scottish economy. Today, any Scottish government, and especially one that has an existential need to demonstrate the economic viability of Scotland, is going to be tempted by the siren calls of investment and jobs in and around Edinburgh. Local government, heavily dependent on the Scottish government for its finance, constrained from raising revenue from local taxation, but in receipt of unfunded mandates, scrabbles for short-term financial fixes. Meanwhile, Edinburgh continues to attract people who want to live here, or visit the city, or do business here. In the three months to September 2016, 1557 new businesses were set up, hotel occupancy was on an improving trend, and unemployment rates show a performance notably better than the Scottish average. The population increased by 9% over the past decade, a quite exceptional rate. This cocktail of pressures sets the context in which the city council has produced its Business Plan 2016-20. It promises that for this four year period “we will take a more commercial approach in considering how to best use our assets and generate income in the context of our overall strategic objectives and management of risk". Presumably, recent years have been characterised by an insufficiently commercial approach to managing and caring for the city. During that period a flagship policy of the council was the Edinburgh 12, a dozen sites identified by real estate consultants as development opportunities, which the council has aspired to see developed. The Business Plan waxes lyrical: “Projects within the Edinburgh 12 initiative include developments such as St James Quarter which have potential to deliver a real and lasting transformational effect on the city.“ While the 1970s brutalist St. James Centre is unmourned, the aspiration for a “lasting transformational effect” to the World Heritage Site, to be achieved by the garish glitz shown in the designs for the redeveloped site, raises fundamental concerns. Do we, as citizens, want our city to be transformed? Rest assured. The business plan promises us “A beautiful city with a rich historic built environment”. “Build excellent places” features as one of three “strategic themes”. Indeed the plan says “Our priority is to maintain our city as an attractive place to live, work and visit. This means having a city built around communities able to access housing options that meet their needs, with well connected accessible transport infrastructure, and enhanced business, cultural, sporting and local infrastructure in all areas of the city.“ To implement this achieve this, the council will spend £23.1 million less on services for building excellent places, a disinvestment of 8% on the 2015/16 spend in the same services. In the real world, to achieve excellence and enhancement “in all areas of the city” would require more, not less, civic investment. In short, this is a plan that Blackadder’s Baldrick would have been proud of. It is studded with words like “economic vitality”, “sustainable”, “empowered communities”, “quality of life”, and (yes) “transformation”. This is the generic language of the new public sector management, the balm spread by consultant’s reports recycled from city to city, where only the name of the city needs to be changed. Even the town of Boring, in Oregon, which I have visited, does not aspire to be an economically stagnant, unsustainable place where communities are powerless and the quality of life is miserable. I know nowhere that does. If this short-term focus for our city lacks inspiration, hopefully the long term visioning exercise launched by the council in September 2016 will redress the balance. It says that Edinburgh needs “an ambitious vision” for 2050. The initiative may have been triggered by the City Region Deal, which is about getting £1bn of public money for infrastructure, innovation and skills. The consultation on the Vision asks what is great about Edinburgh, what could be better, and what is the vision for 2050? Lord Cockburn, in his letter of 1849, said “Edinburgh, except its beauty, has really very little to depend upon. It has little trade… almost no manufactures… we have better things to give us an interest…the more interesting that they are faded.” This insight remains robust. What is great about Edinburgh is its beauty, the quality of its built and natural environment. Our city centre is a World Heritage Site. But the other parts of the city are an essential part of the place package – there are 49 Conservation Areas, 4,500 listed buildings (900 in category A), plus the hills, the shore, the views and the greenspaces. The intangible heritage is also great in this UNESCO City of Literature, where leadership of the Scottish Enlightenment set the path that has made Edinburgh today a world-renowned centre of learning and research. The annual Festival each August again gives the city a global reputation. There is cultural depth here, notably in the many local societies and events, and the year-round fare of drama, music, film, and art that the city offers. In all this there are synergies and histories that weave together, connecting tangible and intangible heritage to create an exceptional place. This makes Edinburgh great, not its shopping malls or new hotels, or volume-builder housing estates or its airport – all of which are clones of their equivalents in other places. Of course, there is a demand, even a need, for such facilities, but they are not what makes Edinburgh great. As Lord Cockburn grasped so long ago, its heritage and quality as a place is Edinburgh’s unique selling point. More than most other cities, Edinburgh is all about uniqueness and authenticity, but these qualities can be vulnerable if they are not properly understood or appreciated. These intrinsic Edinburgh qualities are not just about visual beauty or cultural strengths, important as such things are. They underpin the city’s economy, which is rooted in its long traditions in financial services, learning, tourism and public administration. Just as significant is the contribution to their well-being made by the positive identity that the citizens have with the city and their local areas. Feeling that you live in a special place boosts self-esteem and confidence, and individual and civic pride. Another thing that is great about Edinburgh is that the nature of the place itself has triggered a remarkable tradition of urban innovations. Innovation is not just about technology and white coats in scientific laboratories; non-technological innovation is important too, and the special qualities of Edinburgh as a place have made it globally important incubator of practical ideas about how to manage urban change. Bizarrely, it is a story untold. The New Town was an innovative approach to urban expansion through leadership of the project by the city council (even if it drove them to the point of bankruptcy). The experience of the Old Town was critical to this innovation. Patrick Geddes invented “conservative surgery” when the orthodoxy of the age was to demolish slums, displace the poor and replace them with wide streets and more expensive properties. Without his direct experience of living in Edinburgh, and having the Old Town as a laboratory, would his ideas have developed in the same way? Then in the 1960s, when the New Town itself was sliding into genteel disrepair, and had been identified by the council as the place for a stretch of a motorway-style Inner Ring Road, the residents organised themselves, surveyed the area, resisted the road (the transformational growth project of its day) and invented the New Town Conservation Committee. At a similar time, across in Craigmillar, Helen Crummy invented what we now know as community-based, arts-led regeneration. The germination of that idea was made possible by what she had learned about the area and the way the talents of its people were ignored. Without that experience, and if there had been no Edinburgh Festival, would there have been a Craigmillar Festival Society? The Society then developed the concept of “liaison government” in the early 1970s, anticipating what today we would call local governance. Last, but not least in this list, was the work done by community activists in the 1980s to save the Old Town which led to another practical urban innovation in 1985, the Old Town Committee for Conservation and Renewal. This comprised six councillors and six community representatives, and played a major part in reversing the loss of population that had afflicted the Old Town for several decades. All of these innovations were stimulated by very direct experiences of places in Edinburgh. All were influenced by the past – it is a mistake to imagine that innovation is some ahistorical process, the spontaneous “Eureka!” moment. Apart for the creation of the New Town, all of them were conceived by civil society. Culture, place and the involvement of citizens were central to each of these innovations. At a time when the New Urban Agenda has just been endorsed by the global community at Habitat 3, commiting all governments to readdress the way we plan, finance, develop, govern, and manage cities, Edinburgh’s leaders seem to be unaware that their city has an enviable track record in this global field that gives it a competitive advantage if properly promoted and fostered. Streets are a fundamental element of any city. They connect people and places, and create commercial opportunities. The state of the streets influences walkability and inclusion. Streets provide images and memories. Edinburgh’s streets could be better. Details matter, and our streets are in need of some tender loving care. Large black bins for rubbish and recycling blight the streetscape of tenemental areas, sometimes (along with A-boards, bus shelters and other street furniture) narrowing the footpath to the detriment of those with mobility handicaps. There are uneven surfaces and surfaces that get slippery when wet or covered with rotting leaves. Setts, which are a part of the city’s built environment heritage and identity, are being replaced. Roads are badly potholed. Roadworks seem to be sprung upon us at will by utility companies who commandeer public space, cage it off, shunt pedestrians around, and damage the livelihoods of shopkeepers severed from their customers. The state of a city’s streets can be a barometer of civic pride, and in Edinburgh we are heading for stormy weather. Princes Street, for so long an integral element in the Edinburgh brand, is no exception. Viewed from the Castle Esplanade, the frontages are now a hotchpotch of mediocrity emblazoned by corporate signage. 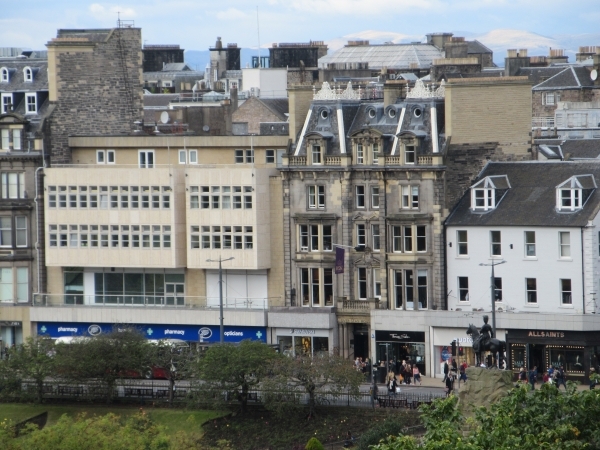 Isolated from its southern aspect, Princes St is becoming increasingly like similar once-prime, but now slightly faded, retail parades in British cities. The “transformational” impact promised for the St.James development could be a coup de grace for Princes Street, while also sucking some of the high end retailers out of George Street. Long-term vacancies of large frontages would be devastating. Meanwhile, the litter bins and other boxes placed at intervals along the south side of Princes Street seem to function as a training ground for would-be graffiti artists, while the bus shelters collect the discarded detritus of takeaway food, lager cans and plastic bottles. Of course it is the southern side of Princes St that has made it famous. However, behind the railings, West Princes Street Gardens is a concern. Familiarity has dulled our eyes to what is there – a fountain that does not work, a bandstand that if it had been proposed today would have generated many objections, and a railway line that slices through the greenspace. Couldn’t it be better? In Chicago, for example, the main railway line is built over in the city centre, and there is Millennium Park in the heart of the downtown, with iconic fountains, sculpture and an auditorium designed by Frank Gehry. A lot of the funding came from the business community. The park works as an inclusive public space drawing families from all across the racially divided city, along with tourists and crowds for concerts. A great city has to be a healthy city. Air pollution is easy to overlook as a health hazard, because it is invisible. It is an issue in Edinburgh, with St. John’s Road the most polluted street in Scotland , with air quality levels 60% above the legal limit. The Herald (17 January 2016) reported that “Dangerous levels of nitrogen dioxide and tiny sooty particles are polluting busy streets in Edinburgh”. Clean air will make Edinburgh better. To enhance Edinburgh we also need to deliver better access to housing for all. The Evening News reported (16 October 2016) that average house prices in the city are now seven times the average salary. It is extremely difficult for families on average incomes to find suitable accommodation in the city, and for those without generous and wealthy parents commuting can be the only option. There is also a need for social housing, and mixed tenure schemes offering a choice of renting, buying or a combination of the two. As things stand, the market will deliver student housing and hotels rather than the houses that are needed to sustain established low-income communities in the city. Quite simply the returns are higher in the short-term, though one might ponder whether by 2050 changes in higher education and in the hospitality sector will make such developments obsolete. Many markets boom then bust. Could we engage with Edinburgh’s highly skilled financial services sector to design innovative financial mechanisms that could underpin a longer term and more inclusive approach to provision of housing, something like civic bonds, for example? It is no surprise that the quality that Edinburgh has to offer means that people want to live or work here or to visit. While growth on the scale seen in recent years might not continue, it is not realistic to imagine that either population or visitor numbers can be capped at some “optimum” figure. However, it is important to ensure that growth adds to what the city can offer, rather than detracting from it. Urban extensions need to be in planned locations, rather than ad hoc releases of green belt land after appeals or quixotic decisions by the Planning Committee. Why not set standards to designate some as New Conservation Areas, based on design quality and their environmental and energy standards? Why not an Edinburgh Zero Energy District? To get such outcomes needs vision, political will and professional expertise. It can be done, not least because Edinburgh is a city that attracts people and investment: it is not a shrinking city. There are “situations of opportunity” (Svane, 2008), e.g. the use of design competitions, that a confident, strategically focused and ambitious city administration could create and exploit. There are similarities, for example, with Stockholm. There the Hammarby Sjöstad district has been developed from the 1990s on brownfield land, using the “Twice as good” principle. All environmental standards had to be twice as good as the conventional norm. It wasn’t just a case of giving a planning permission and hoping the developer would build rather than bank the land as collateral to borrowing to develop elsewhere. The project, which produced 9000 apartments, was driven by a multi-professional team within the city council. The infrastructure went in first, and high levels of recycling are achieved without huge unsightly bins cluttering the circulation areas. The solid waste is disposed of through underground suction chutes that take it to a collection centre, where it is sorted and recycled. In contrast, Edinburgh still has substantial areas of brownfield land lying empty, after the financial crash stalled reuse. To make Edinburgh better, such sites need to be developed. If the City Region Deal is to provide money for innovation, might some of that go to experimenting with community land trusts in regeneration areas, backed by local design and development teams, and with a brief to focus on synergies between design, training, economic development and the fostering of local social enterprises? If we are to make Edinburgh a better place, there needs to be a step change in civic governance. In recent years the city has been beset by a number of high profile failures which have drained the confidence of the citizens. The tram project became a cause celebre. There was the statutory repairs scandal, which has damaged not only the Council’s reputation, but also the maintenance of properties throughout the city. Then came the defects in the schools developed under the public private partnership scheme (Farah, 2016), resulting for weeks in children being bussed around town in search of somewhere where they could be taught. Now we have the saga of the hotel proposed for the old Royal High School. There should be no place for “commercial confidentiality” in civic contracts: such conventions exclude the citizens from legitimate interest in what is being done to their city. Principles of civic life have been thrown overboard in favour of a business model that by prioritising short term disinvestment / savings is a threat to the things that have made Edinburgh a successful place. Just as BHS was run so as to cash in its assets and take money out of the business, so Edinburgh is being run to capitalise assets and cut back on maintenance, as the Business Plan 2016-20 shows. The city is muddling through, and the launch of Edinburgh 2050 is tacit acknowledgement of the fact that such short-termism is a long term threat to the capital. Instead of aping in the civic sphere the practices that led to the demise of so many British businesses, we should be looking for approaches to civic governance that foster civic identity and civic pride, while being built around an understanding of the iterative nature of innovation processes. We might even experiment with some Geddes-style “thinking machines”, e.g. warping Place-Work-Folk into Place-Innovation-Citizens, as shown in Diagram 1. Place Place heritage – tangible and intangible – the city’s uniqueness. Innovative places, e.g. incubators, hubs, cheap spaces for start-ups; university/city co-working. Citizens actively creating and managing places, e.g. community land trusts. Innovation Innovation in place interventions - how we design and manage places, e.g. Zero Energy District. The innovation of innovation – what new ways are there to invent the future? Creative workshops. User-led urban innovations, e.g. council / housing association / finance industry / tenant co-working on housing solutions. Citizens Place-focused citizen organisations, e.g. The Cockburn Association. Ideas competitions on best ways to enhance Edinburgh, its region and neighbourhoods. An Edinburgh Civic Charter setting out how citizens want their city to be developed and governed. Diagram 1: Ways of thinking about improving Edinburgh. Diagram 1 is merely playing with ideas; hopefully others can improve on it. The point it is trying to make is that there really is potential to make Edinburgh better if we bring together its place heritage, its citizens and a focus on innovation. We need to use our past to inspire our future, not to see it as an obstacle or a liability. We need a 21st century set of ideas about how to make cities better, not discredited ones from the 1950s or 1980s. Urban health provides a “what if?” example. It is a global concern. Research is increasingly pointing to the links between how we live in places and our health and well-being, and that cultural activities can have therapeutic qualities. Edinburgh has a global reputation as a centre for medical research and training and for its cultural festival – they are part of our heritage, and so, I have argued is bottom-up urban innovation. So if we were really serious about a vision for Edinburgh 2050, we would be actively connecting the potential players, and combining quick, monitored local experiments (greenspace enhancement, local food networks, clean air, user-led safety audits, civic and local pride initiatives, crowdsourcing and big data etc.) with a long term research and development strategy that was globally networked around themes like aging-friendly places and closing urban health inequalities. In short, Edinburgh needs to remember what it is that makes it a special place, and rebuild civic pride and restore the citizens to the centre of the governance process. My vision is of a city defined by its quality as a place - its skyline, buildings, streets and spaces that have been sustained and enhanced. A city that has used its growth to further that identity, and become more inclusive, a city that has avoided the fate of other “heritage” cities where residents have been displaced and the city becomes a theme park. Edinburgh 2050 will be a unique place, sustained by a shared civic culture based on a deep sense of stewardship. So what could possibly go wrong? Lord Cockburn knew. In that famous letter he warned of “some who see nothing valuable in a city except what they think convenience… they hold a town to be a mere collection of houses, shops and streets… this class exists and from its activity and imperviousness is always to be feared…”. No doubt with a waspish sigh, he anticipated obstacles: “Incompatibilities between private and public interests… Bad taste in proprietors… Inconsiderate use made of their powers by public authorities…” Is it too much to hope that we can leave these in the past where they belong, and that others will join the Cockburn Association in thinking positively about Ways to Enhance Edinburgh by taking inspiration from what made it a special place?